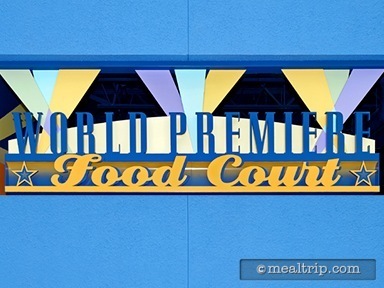 While Disney's All-Star Movie Resort does have the Silver Screen Pool Bar, the larger "World Premier Food Court" is the resorts only full-time restaurant. While there is quite a bit of seating at the location, this area feels a bit smaller than the other "All Star" food courts. We're not sure why that is. It's just an observation. 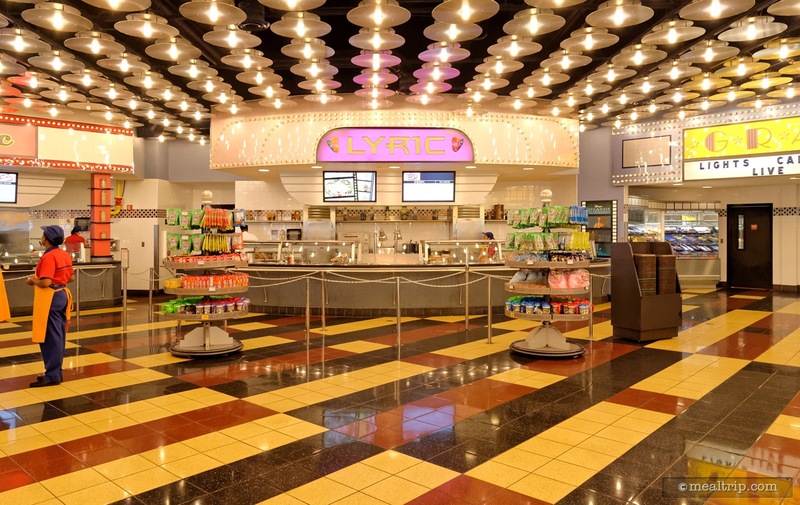 The food court area itself (where you pick up your food), is simply stunning with hundreds of marquee style lights overhead reflecting off the polished floors. Hot breakfast items are served from 6:00am until 11:00am and include mostly “American Standards” entrees including Mickey Shaped Waffles, Pancakes, French Toast, and a couple of "eggs and… meat" platters. There are also four or five made to order omelets that are usually served with breakfast potatoes, and a unique Breakfast Flatbread which includes scrambled eggs, sausage gravy, bacon, and melted cheese.